Posted on 10, November 2016 by EuropaWire PR Editors | This entry was posted in Awards, European Union, Government, Law, Netherlands, Romania, Society and tagged CEP awards, Intensive Intervention Risk Management Service, Public Protection Award for Resettle project, the National Probation Service in England. Bookmark the permalink. The CEP award for the category of Public Protection was handed at the CEP Conference on Alternatives to detention in Bucharest by Mr. Mihai Dima, General Director of the Romanian National Probation Directorate and Mr. William Rentzmann, board member of CEP and member of the CEP Awards Jury. 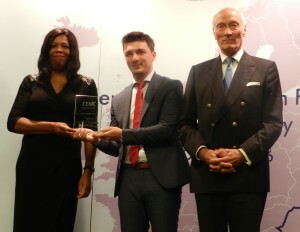 The award received by Ms. Sandra Oluonye, Assistant Chief Officer at the National Probation Service. UTRECHT, 10-Nov-2016 — /EuropaWire/ — In October 2016, CEP launched the CEP awards, a celebration of outstanding contributions to probation. The awards scheme reflects CEP’s vision: to contribute to safer communities by rehabilitating and reintegrating offenders and providing the best possible interventions to reduce re-offending and the impact of crime. Second of 4 categories is the Public Protection Award. Winner is the Resettle project – Intensive Intervention Risk Management Service by the National Probation Service in England. Former offenders often need intensive coaching for issues like housing, education, training, employment and budgeting. But also to prevent the risk of re-offending, coaching is key. The project Resettle is a partnership between the National Probation Service, local policeforce and the local Health Trust in Liverpool, working intensively with male offenders on release from prison. All have complex, social and psychological needs and are at high risk of further offending. Typically they will have served long prison sentences having committed serious violent or sexual offences. They have a high level of interpersonal and social difficulties associated with personality disorder diagnosis. The overall aim of the project is to enhance public protection and risk reduction by engaging and working productively with a “hard to reach” group of men, many of whom have struggled to abide by licence conditions, spent significant periods in segregation and on release would have been recalled back to custody. The majority have had early experiences of neglect, abuse and trauma leading their struggle to trust others; to the extent that they often have highly conflictual prior relationships with authority. The project has been operational since 2008 and has consistently demonstrated that it is possible to engage, safely manage and enhance the wellbeing and social integration of people with complex needs and risks. The service model emphasises the need for the development of safe, supportive and optimistic relationships which give the men a sense of their own ability to desist from offending and live fulfilling lives. Risk management is done alongside therapeutic work in the firm belief that these are equally important. Work with the men starts at least 6 months prior to their release from prison with a focus on relationship building, developing a personalised risk management and intervention plan to best meet their needs and mutually agreed goals. Once a participant agrees to come to the project, their attendance becomes a licence condition. The project adopts a “through the gate” service with participants picked up from the prison gate, with a high level of support offered on release. They attend for up to 4 days per week during which they participate in groupwork, individual keywork sessions and activities to support their social integration and steps to independent living. The project creates a strong sense of community which encourages the men to comply with their licences. They are encouraged and supported to take on new roles including participating in communal cooking of lunches, describing the project to visitors and looking after the garden. The week starts with a whole Community meeting at which aspects relating to safe running and maintenance of the project is discussed. Additonally progress and challenges of participants are discussed and men are encouraged to support each other in meeting their goals. Since the commencement of the project the Resettle team has received over 200 referrals and has worked with 68 participants. The project is funded to work with 20 men in the community and a further 25 in custody at any one time. The men attend for up to two years. Risk management and responsivity is enhanced through an out of hours crisis line. A recent review of the effectiveness of the crisis line found it had successfully managed to avert crisis, offer support to participants at pivotal moments and very little abuse of it’s use. Recent feedback from a consultation group of service users highlighted comments such as “staff are there for me when I am struggling” “They trust you and you trust them” , “it is the first time I have had people around who you can ask for help, which is not easy to do ” and ” I am 47 years old, it can feel embarassing to admit you are struggling, but having support and being treated like an adult has helped me cope”. The Resettle Team is very passionate about the work it undertakes to bring about change to an individual’s life and most importantly in the effective management of risk. This is demonstrated in the joint approach to delivering the sentence plan by the keyworker team, comprising of the Offender Manager and a Health worker through case consultation. Resettle has been independently evaluated by a randomised control trial which completed in 2013. This lent the support to the level of intensity of the service delivery model, confirming that the population the project works with have a high level of need, risk and complex mental health difficulties. The research found a significant difference in the rate of self reported offending between those who attended Resettle, those in the control group (i.e those attending normal probation supervision) and those who were randomised into Resettle but never attended, e.g not being released prior to the research ending. The Resettle group reported significantly lower rates of further offending.